The perfect fall bag is one of those illusive items that you’re always looking for yet never seem to find. You want something seasonal with a touch of fur or faux fur, something that really speaks to the transition into cozy sweaters and hot chocolate. Yet, if it’s a seasonal item, you may not want to pay an arm and a leg. This little number is one of those perfect seasonal bags! 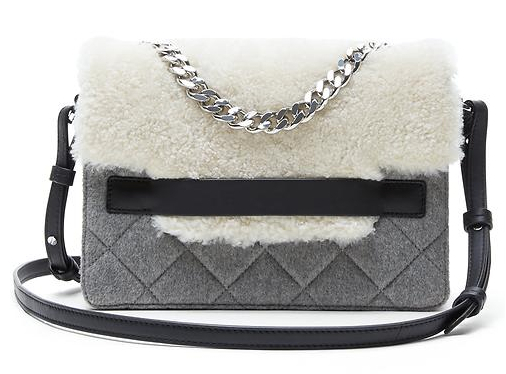 The Shearling Flap Chain-Shoulder Bag from Banana Republic has a quilted wool body, shearling flap, chain detail and leather cross body strap. Perfect for everyday! And if that’s not enough the price tag makes this deal even sweeter! Regularly $248, but with the Friends & Family discount through Sunday online, this perfect fall bag rings in at $149. Use code: PWCVQTRZ7L6W for 40% off online.